For the American screenwriter, see Fredric Lebow. Fred Lebow (June 3, 1932 – October 9, 1994), born Fischel Lebowitz, was a runner, race director, and founder of the New York City Marathon. Born in Arad, Romania, he presided over the transformation of the race from one with 55 finishers in 1970 to one of the largest marathons in the world with over 43,660 finishers in 2009. He was posthumously inducted into the National Distance Running Hall of Fame in 2001. Lebow ran in the inaugural marathon in 1970, finishing 45th out of 55 runners with a time of 4:12:09. He ran his last NYC Marathon on November 1, 1992 in celebration of his 60th birthday, after being diagnosed with brain cancer in early 1990, with his friend, nine-time NYC Marathon women's winner Grete Waitz, with a time of 5:32:35. During his career he completed 69 marathons in 30 countries. Along with the NYC Marathon he also organized the Empire State Building Run Up, the Fifth Avenue Mile, and the Crazy Legs Mini Marathon, the first strictly women's race. Lebow was also president of the New York Road Runners Club for twenty years. His memorial service at the finish line of the New York City Marathon attracted a crowd of 3,000 mourners, which was, at that time, the largest memorial gathering in Central Park since the death of John Lennon. In 1991, Lebow established Fred's Friends as the first official charity of the New York Marathon. The program uses marathon runners to raise funds for cancer research. In 1995, Fred's Team was established in honor of Lebow. Every year, athletes of all abilities join Fred's Team to compete in marathons, half-marathons, triathlons, bike races and other endurance events around the world to raise funds for pioneering research at Memorial Sloan-Kettering Cancer Center. Since 1995, Fred's Team has raised more than $52 million. In Lebow's honor, a sculpture of him was created by Jesus Ygnacio Dominguez. Unveiled on November 4, 1994, it depicts Lebow timing runners with his watch. 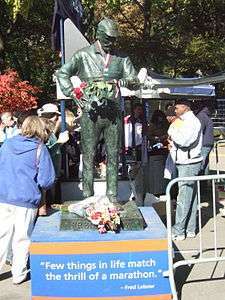 In 2001, the statue was moved to its permanent location on the East Side Central Park Drive at 90th St. Every year the statue is moved to a spot in view of the finish line of the marathon. The documentary Run for Your Life tells the story of Lebow and the New York City Marathon. ↑ "Grete Waitz reflects on her, & Fred Lebow's, last NYC Marathon - NY Daily News". Daily News. New York. ↑ Vecsey, George (November 2, 1992). "NEW YORK CITY MARATHON: Sports of The Times; Fred and Grete Win All of New York City". The New York Times. ↑ Robbins, Liz (October 24, 2010). "Charities Gain Traction in Marathons". New York Times. p. SP4. Retrieved 17 October 2011. Run for Your Life Documentary film by Judd Ehrlich about the life of Fred Lebow.